Swag S Cigars - Buy Premium Cigars Online From 2 Guys Cigars . 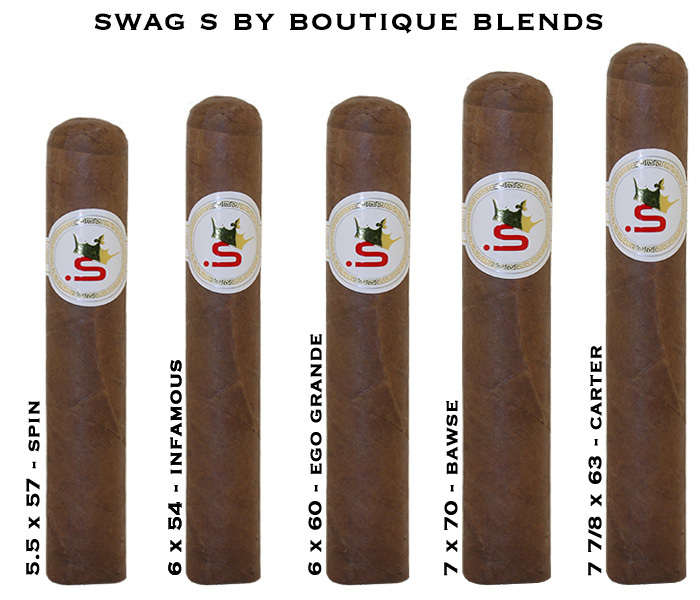 The Swag S is the maduro blend of the Swag Cigar Line from Boutique Blends. All 5 sizes come in 20 count boxes and is medium to full in terms of body and strength. "The latest edition to the popular LifeStyle line, the S reflected the taste of young and modern smokers who are tired of the same old traditional brands." The Swag S is made with Dominican premium tobaccos as binder and filler with an oily and pristine dark Nicaragua wrapper loaded with flavor. Incredible blends, oversized smokes, perfect construction and an incredible taste. This is the Swag S from Boutique Blends. All five sizes are geared toward larger ring gauges.... sold to you for as low as 2.99 each.